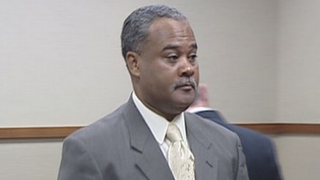 Chauncey Carthan, a former detective with the Louisville Metro Police in Kentucky, had been drinking brandy at a friend's house Sept. 4, 2012, before he hit the road in his unmarked police car. During his drive, he spotted a speeding Ishmael Gough, 24, and decided to pull him over. According to reports, the situation at that stop escalated, and Carthan claims that Gough lunged at him, causing Carthan to pull his weapon and shoot Gough in the leg. On Friday Carthan, 54, who retired from the force after a November 2013 investigation of the shooting found that he had violated department policy, was cleared in the shooting. He was, however, found guilty of driving under the influence and ordered to attend an alcohol-intoxication class and pay a $500 fine, the Louisville Courier-Journal reports. The officer reportedly told the jury that he didn't have a problem with the shooting because, he said, "I was fighting for my life that night," according to news station WHAS. "He doesn't get to hide behind the fact he's a cop," prosecutor Nick Mudd told the Courier-Journal. "When you got in the car and you were drunk, you stepped outside of that role." Gough was never charged in the incident. Read more at the the Louisville Courier-Journal and WHAS.